The Ectaco jetBook ereaders are very popular in some circles and I’ve been meaning to add them to the site for a long time. So here it is, the new Ectaco jetBook page, complete with specs, photos, and a video review of the jetBook Lite from YouTube. Check it out for a quick look at the two jetBook ebook readers and the soon-to-be announced jetBook Mini, a new device that’s shrouded in dark clouds of mystery. In recent jetBook news, last week Ectaco issued a press release announcing that both the original jetBook and the jetBook Lite now support Adobe DRM for EPUB and PDF ebooks purchased from a number of major ebook retailers. 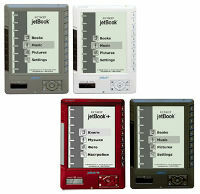 The jetBook previously supported Barnes and Noble’s eReader DRM (PDB) for ebooks from B&N, Fictionwise, and eReader.com. In addition to adding Adobe DRM, which also makes it possible to borrow ebooks from local libraries, the latest firmware update for the jetBook includes support for 4 new language: Arabic, Farsi, Vietnamese, and Hebrew. In case you already own a jetBook, you can download the new firmware update on the jetBook website.